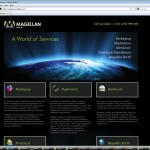 We revamped the portal page for Magellan World Ltd and the new site is now live. As of now it’s literally only a one-page portal, linking to all other Magellan World services and websites. We didn’t want to complete abandon the new design we introduced for magellanworldpackaging.com, yet we wanted to do something a little different for the portal page. We generally don’t recommend dark or black backgrounds, but in this case the main image inspired to play with a plain black background and a part of the image as an additional background effect. The only change we made to the original image was to apply a gradient to the top and the sides to ensure its blending with the black background.